Zhang Hao brings China the first gold medal of the WFSC 2015!!! First gold for Feng Hui and second for the Chinese WFSC 2015 collection !!! Ukraine receives the gold medal thanks to Bohdana Hotsko!!! Huang Hai Yang wins third gold for his country!!! 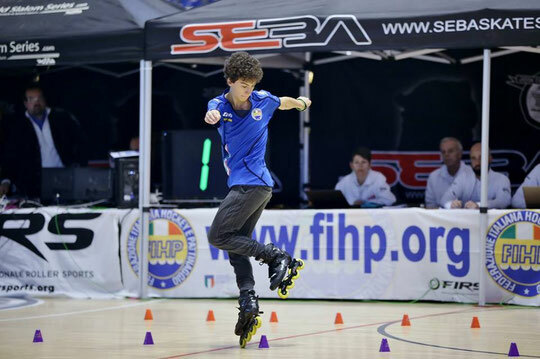 Thomas Rataud and Maeliss Conan bring two gold medals to France!!! First gold medal received by Chinese Taipei!!! Zoe Granjon won the gold for France!!! Two more medals for China!!! Guo Fang and Zhang Hao are the World Champions for the third year in a row!!! Zhang Hao is the triple World Champion for the second year in a row!!! Feng Hui is the World Champion in the Junior Classic for the 5th year in a row!!! Su Fei Qian got the World Champion title back!!! Sergey Timchenko confirmed the World Champion title and brought the first gold medal to Russia!!! Two medals for Russia were received by Timchenko brothers!!! Daria Kuznetsova confirmed the Battle World Champion title!!! Zoe Granjon is the Speed Slalom World Champion 2015! Iranian Champion is getting ready for the new season! Cara Brooks is the triple American Champion 2015!!! Zoe Granjon at the top of the world! Klaudia Hartmanis continues to win! Daria Kuznetsova : Return of the champion! WSS Brasil 4 : Victor Fialkovics showed his best result ever! Jon Larrucea : still skating around! Valerio Degli Agostini : the promising start! Zoe Granjon : Couldn't be higher! 7 Champion titles for Klaudia and Michal! Hervé Guillou : at the top of the Freestyle Slides Ranking! Michał Sulinowski : an incredible experience! Daniele Lenzi : Freestyle world is cool! WSSA Judges : New freestyle season's wishes! Valerio made a very impressive and fast way up. 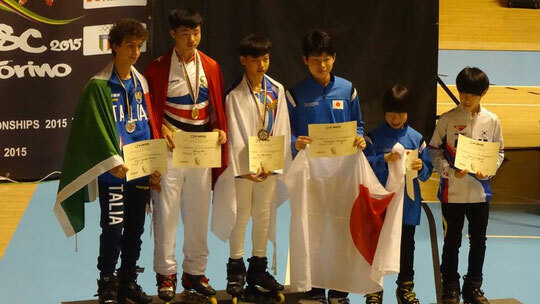 He was awarded by WSSA as the most potential skater of the year. Check his interview about his successful season below! P.S. When and how did you start to skate? Valerio. I started in 2006 thanks to one of my friends, who was already skating. I remember, since the first day i’ve tried freestyle slalom, I joined a skating course. Then, as I was a kid I was skating just for fun, but since 2012 I started to train Freestyle Slalom and Speed Slalom skating seriously. P.S. What is your greatest achievement for the moment? Valerio. This was a really successful season for me! At the beginning i never thought I would make all these results during the year! In my opinion, my best achievement for the moment is the two second places during the WFSC in Turin. I never took part in a World Championship before and especially I never competed with the Asian skaters so I just tried my best and I am really happy about the results! P.S. What did you feel when you were awarded as the most potential skater of the year? Valerio. I was surprised as I had not heard about the WSSA awards before! My coach told me that i was nominated just the day before the WFSC and I felt really happy, knowing that someone noticed my efforts. P.S. 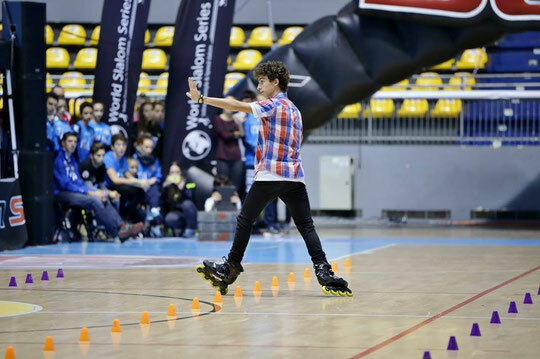 Do you have any idol in Roller Sport? Valerio. For me the Chinese skaters were always the perfect ambassadors of freestyle slalom and I always dreamed to become as good as them or even better! Now I’m working hard and I hope that one day my dream will become true! P.S. Which competition was the most memorable for you? Valerio. The best competition for me was the WFSC because as I’ve already said that was my very first World Championships and it was unforgettable! Everything was so cool : the event, the skaters and I finally could meet and know better Chinese skaters as I’ve always dreamed. P.S. Which competition are you dreaming about? Valerio. My dream is to compete in the Shanghai Slalom Open competition! I think that the skating spot is nice, and many strong riders are attending. I never left Europe for the moment, so Asia is an absolutely unknown place for me and I would really want to go there! P.S. Do you have a last word for the skaters? Valerio. I would want to thank everyone who supported me during this fantastic year, especially my coaches and my teammates! I hope that winter will finish soon and that the new season will start! Even though I will be a senior next year, and I will have to work hard for being competitive in the new age category, i look forward to the new season!